Photograph of the first conference in 1911 at the Hotel Metropole. 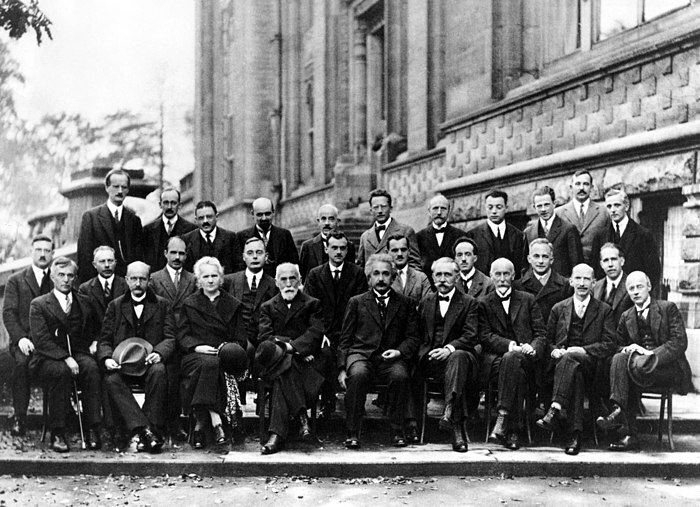 Seated (L-R): W. Nernst, M. Brillouin, E. Solvay, H. Lorentz, E. Warburg, J. Perrin, W. Wien, M. Curie, and H. Poincaré. Standing (L-R): R. Goldschmidt, M. Planck, H. Rubens, A. Sommerfeld, F. Lindemann, M. de Broglie, M. Knudsen, F. Hasenöhrl, G. Hostelet, E. Herzen, J.H. Jeans, E. Rutherford, H. Kamerlingh Onnes, A. Einstein and P. Langevin. The International Solvay Institutes for Physics and Chemistry, located in Brussels, were founded by the Belgian industrialist Ernest Solvay in 1912, following the historic invitation-only 1911 Conseil Solvay, considered a turning point in the world of physics. The Institutes coordinate conferences, workshops, seminars, and colloquia. Following the initial success of 1911, the Solvay Conferences (Conseils Solvay) have been devoted to outstanding preeminent open problems in both physics and chemistry. The usual schedule is every three years, but there have been larger gaps. This conference was also the culmination of the struggle between, on one side, Einstein and other scientific realists—who wanted strict rules of scientific method as laid out by Charles Peirce and Karl Popper—and on the other, Bohr and other instrumentalists, who wanted looser rules based on outcomes. [vague] Starting at this point, the instrumentalists won, instrumentalism having been seen as the norm ever since, although the debate has been actively continued by the likes of Alan Musgrave. 5 1934 L'Oxygène, ses réactions chimiques et biologiques Oxygen, and its chemical and biological reactions. ^ Paul Langevin and Maurice de Broglie, eds., La théorie du rayonnement et les quanta. Rapports et discussions de la réunion tenue à Bruxelles, du 30 octobre au 3 novembre 1911, sous les auspices de M. E. Solvay. Paris: Gauthier-Villars, 1912. See also: The Collected Papers of Albert Einstein, Vol. 3: Writings 1909–1911, Doc. 26, p. 402 (English translation supplement). ^ Isaacson, Walter (2007). Einstein: His life and universe. New York: Simon & Schuster. ^ Leplin, J. (1984). Scientific Realism. University of California Press. ISBN 978-0-520-05155-3. Straumann, N. (2011). "On the first Solvay Congress in 1911". European Physical Journal H. arXiv:1109.3785. Bibcode:2011EPJH...36..379S. doi:10.1140/epjh/e2011-20043-9. Wikimedia Commons has media related to Solvay Conference. Bacciagaluppi G., Valentini A. (2009.) Quantum Theory at the Crossroads: Reconsidering the 1927 Solvay Conference, Cambridge University Press, Cambridge, U.K.